An old and challenging question is, "What is art?" 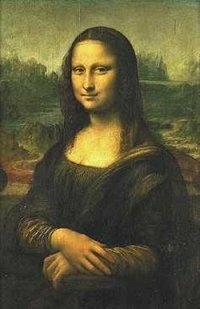 The question is probably as old as art and artists; the moment someone made a cave painting, someone else probably asked, "But is it art?" 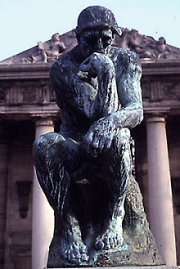 It's possible the question cannot be answered in any objective way; we may each have a personal definition of art. Here are some of my thoughts on the matter. This essay is strictly about the first question. Critical review (whether a piece of Art is good) and taste (whether you like it) are separate matters. Second, art is hard to define because, like love, it is a fundamental concept. That makes it relatively easy to describe (one can cite the Mona Lisa or Burns & Allen), but hard to define. Definitions require concepts more basic than the thing defined. Just as buildings are defined by bricks, steel and glass; concepts are defined by basic "building block" concepts. But what is more basic than art or love? The many forms of art (for example: paintings, dance, music, movies), show its enormous range and scope. As with love, the fundamental nature is demonstrated in the variety of ways we express it. Any definition we pick must be equally large in scope. In any event, the duality between artist and consumer complicates finding a definition, since it must apply to both. It also begs the question of whether art is art if created strictly for the artist and never consumed. If the answer is that consumption is not a part of art, then art need be defined strictly in the context of the artist. Which brings me to my personal definition. But my definition of art—that it is created by an artist—does one very important thing: it narrows the scope down to products of the mind. It draws a definite line between that which is simply beautiful or appealing and that which was made in a creative act. A sunset or a landscape is not art, no matter how beautiful it is. The Grand Canyon, despite the fact that its sheer breath-taking beauty and majesty always make me weep (seriously, literally) is not art. But depictions of beautiful things, photographs, paintings, perhaps even written accounts or songs, can be. Now what about, say, a shuttle launch? Here's another thing where the beauty, power and majesty (not to mention the implications behind it) also brings me to tears. 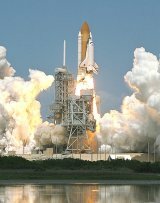 The shuttle is a human-made thing; the launch is done by humans. I'm going to say that the shuttle launch comes close to being art, but doesn't quite cross the line. Explaining why is difficult, though. Basically, it has to do with the purpose behind the making. Which brings me to trying to define what I mean by artist. Perception & Interpretation: Art interprets some aspect of the artist's perceived reality. The reality may be completely imaginary, partly imaginary or based fully on reality. A novel might have imaginary aliens on an imaginary planet. A photograph of a sunset can be an artistic vision of a real thing. Expression & Medium: Art is the expression of the artist's interpretation. That expression can take many forms (mediums): music, paint, sculpture, cinema, dance, literature. There is always some medium of expression to Art. Expression is the bridge between artist and consumer; it is how the artist, and the art, speaks to us. Artists are those who are driven to express their interpretation of reality. Artists are people who have a need to create Art. What is art, and what is not art. What is good art, and what is bad art. What is art you like, and what is art you don't like. These are all separate questions. They all can be difficult—perhaps impossible—to answer objectively. The last one is obviously entirely subjective and subject to your personal tastes (and not at all the topic of this article). But there might be some objective criteria that help us answer the first two. If something can be objectively identified as art, perhaps we can also find objective criteria to distinguish between what is good and what is bad. The line can be blurred by artists with great artistic soul, but who have poor technical skills (or meager resources). In such cases, sometimes the inner artist shows through (or not). As mentioned above, I define art to be created by a mind. This eliminates sunsets and the Grand Canyon, but might allow shuttle launches. What eliminates those is that a shuttle launch has a utilitarian function. The reason behind its design and construction are utilitarian. It is not intended as a work of art. My definition of art requires it be intentionally created as art. Is paint thrown a distance onto a canvas art? How about a painting of a Campbell's soup can? Is a "sculpture" consisting mostly of a urinal with an ironic title art? I think the answer lies in the intent and expression of the artist. Randomly applied paint can be intentionally selected for its color. The application of each color may be random, but the overall expression may not be. 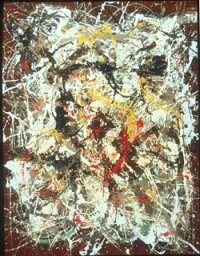 Consider Jackson Pollock's work, for example. Repeatedly applying random splashes may result in something the artist intends. 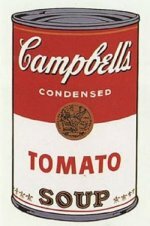 Andy Warhol's famous soup can paintings had a specific message; they were intentional statements. The artist had a perception of his reality, and he expressed that using his command of his tools. Definitely, the soup cans were art. Weird sculptures also can be an interpretive expression of an artist's reality. A difficult trick here may be determining whether the statement is genuine or banal. The oddness of the medium can distract from the content. If the perception, interpretation and expression brings something new to light, then maybe even that urinal is art. There has been a bit of a battle between film critic Roger Ebert and lovers of video games as to whether video games are art (as Ebert perceives film to be). I think there's no question that these games contain visual and musical art. The question really boils down to whether the game itself is art. I am increasingly of the opinion that they can be. Ebert's point, perhaps, is that no matter how artistic the chess pieces might be, the chess game is not art. I think that the video game itself may be the chess pieces (and therefore art). Playing the game is no more art than playing chess is. In the end, we may simply return to the beginning: Art is in the mind of the creator and the consumer. Is it art? That's up to you. Some things clearly are not art, but there seems to be plenty of gray area that leaves it up to personal choice.